Made of Steel for a Durable Periodical Dipsplay. 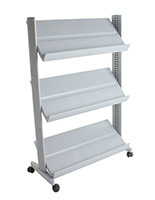 Assembles in Minutes without the Need for Tools. 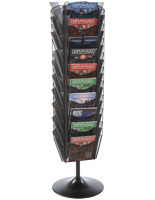 This rotating metal magazine stand is a four-sided literature rack with 20 pockets on each side. 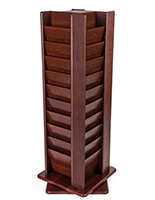 The slots on the freestanding holder are angled and long to fully support the forms inside and keep them from bowing over. 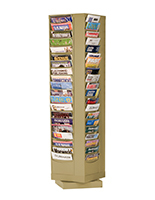 The magazine stand that is made of steel is perfect to be placed in busy libraries, waiting rooms, or offices because it is built to last. 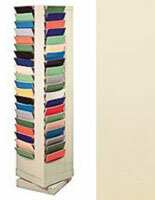 The literature rack with 80 slots comes in grey and is able to coordinate with many settings. 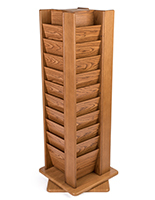 The stand is able to easily turn on its base to each of the four sides to show patrons all that is placed for browsing. 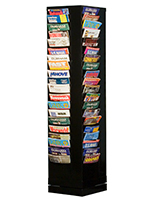 The pockets on the display are deep and allow for thicker periodicals or many forms to be placed in the freestanding holder.